Life with the Lashers: TGIF! It's Friday and I couldn't be any happier that the weekend is a few short hours away. It's been a pretty hectic week around here, to say the least. And the best part is that it's a 3-day weekend... yay! We have a busy weekend planned, but we also have a lot of down time scheduled. Tomorrow we will be heading to our favorite beach, Siesta Key, which is just outside of Sarasota. It's our favorite beach because the sand is as soft as baby powder and it's a impeccably well manicured. There's also fun little shops and restaurants in the area, which make it fun. It's a laid back beach town and it's the only beach we really go to. We're going there for a special occasion, but I can't say what that occasion is exactly, in case the person who we are honoring reads this blog. We're just going for the afternoon/evening for some late afternoon beach time and dinner with friends. This time of day will be perfect for us, as I like to keep my kids out of the sun as much as possible, given that we live in Florida and the sun is brutal. I prefer to keep them lathered in sunscreen (well, at least Bella) and in the shade as much as possible. It should be a good time and the girls should be well rested by the time we arrive. Sunday we will be attending a Memorial Day BBQ at one of Ian's co-worker's homes. He and his wife have graciously invited our motley crew to their house, which should be interesting. They have a son who is a few months younger than Bella, so I'm sure she will have fun playing him and bossing him around. This is another late afternoon event, so again, the girls should be well rested for all of the fun. I've actually never met this co-worker of Ian's, but I've heard a lot about him (good things of course). It's great to meet our families from Ian's firm, especially those with kids close in age to our kids. Monday we have a family photo session scheduled. I purchased a Groupon awhile ago and totally forgot about it. It's about to expire so I scheduled a session for our family. It'll be our first photo session as a family of four. I've been searching for the perfect outfits for the girls and me all week. As of today, I've only found a dress for myself and I still need to find outfits for my two girls. Hopefully everyone is in a good mood and cooperates... the only one I'm really concerned about is Bella. She seems to have a love/hate relationship with the camera. For the sake of my sanity, I hope she loves the camera on Monday because I would like nothing more than gorgeous pictures of our adorable little family. I'm not expecting much because it's an indoor photo shoot and I prefer outdoor photo shoots. I will definitely need to schedule an outdoor shoot with our favorite photog, Ursula. My girls are both sound asleep at the moment and I'm enjoying the peace and quiet. We had a rough morning, complete with several toddler meltdowns. Fortunately, a trip to our favorite park turned that frown upside down and we had a fun morning with friends. Bella was exhausted on the way home from the park and fell asleep for a few minutes in the car. Bless her little heart... and God bless her for still taking a decent nap once we got home. We will most likely be hanging out at home tonight and resting up for our busy weekend. Happy Memorial Day weekend, y'all! 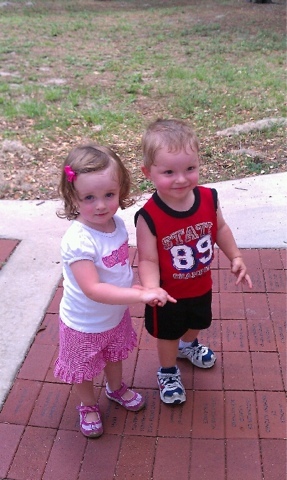 Bella and her BFF Connor at the park... and yes, they're holding hands. 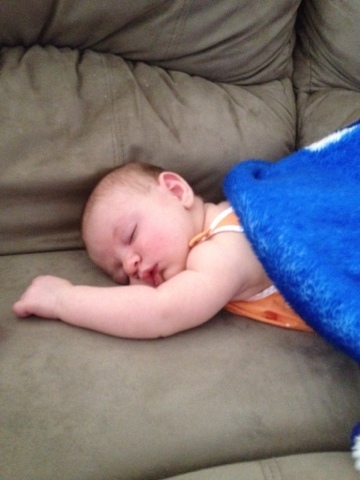 CeCe Rose, catching some z's on the couch.